You might be wondering how Berry is doing these days. Well, for starters, she's turning 9 months old next week! How time flies no? She's been cruising about, putting everything she can in her mouth, saying Dada all the time, and she actually stood on her own with no support yesterday (we were at her friend Max's place and she got so excited with Max's giant Legos she grabbed one on each hand and ended up standing by herself!) Her motor skills are really something! I think I have to prep myself for endless hours of running after her once she starts sprinting around! She can wave hi! and bye! (saying Baba while at it too!) and she babbles a lot! I think this little girl is going to be as talkative as I am! Well, let me stop rambling and let me show you Berry now! 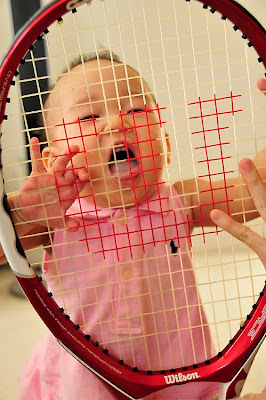 Dada hopes she'll be a tennis star when she grows up. I don't mind. 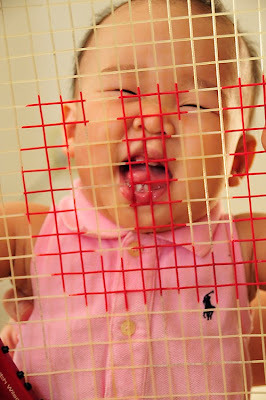 I'll help Berry design her tennis outfits with Nike hahaha! i love you berrypova! you are so cute w strawberries on top!!! berry in her pink RL...shes so cute! tia has the same outfit but in light green. we are such doting mommies! awwww :D i'm a long time reader but i just had to comment na :D berry is so adorable!